Over the past few years, there's been a lot of talk about Thailand's infamous Full Moon Party. A lot of it sadly has been negative but that didn't put me off. Now I've been, I thought I share with you a few tips on how to survive what is perhaps the worlds biggest party. This is pretty much solid advice for while you're travelling around anywhere but I think it's especially useful in this scenario. 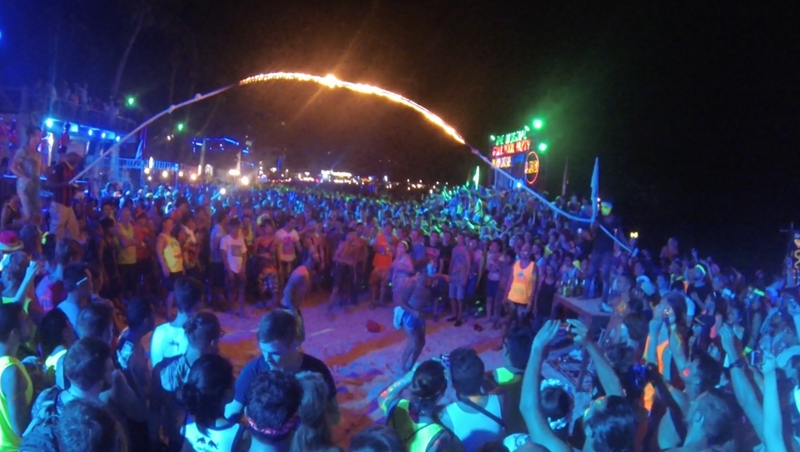 While Thailand has tough drug laws, it's no secret that they're readily available at the Full Moon Party. You don't particularly have to go searching for them either as most 'dealers' will approach you in passing. My advice is to stay well away. The worst case scenario is that you end up in a Thai jail (pretty awful) or hospital and the best one is that you end up shelling out a couple of hundred baht on a bribe. Neither of which are winning scenarios lets be honest. I'm first of all talking about water. I'd say for each alcoholic beverage you have, try and have a bottle of water to match. While this might mean spending more baht in the bathroom, it should also mean you make it till morning. Boring stuff aside, let's talk about alcohol. It's pretty much everywhere down in Haad Rin. On the walk to the party, there are stalls everywhere selling beers and the famous buckets. While beers won't cause you trouble, the buckets are pretty much lethal. At a guess, I'd say around 2/3 buckets would probably have most people on the floor. You definitely get bang for your baht but do be careful. If you're in a group, try sharing buckets instead of having one each. That way you can try more combinations; maybe save money but you'll also last a while longer. On a sort of related note, beware the Thai Red Bull. It's not like what we get here and I remember a local telling me they contained an equivalent to speed. Just a little something to bear in mind. While the sea might be alluring during the day, of an evening (especially after a drink) it can be one of the biggest hazards you will encounter. If you're inebriated, there is every chance you might drown. It's very slim but is it a risk you're willing to take? It's also important to note that there are boats pretty much lining the shore and visibility isn't that great. As you can probably imagine, being around these boats can also lead to a whole host of accidents. Accidents aside, you'll probably notice that there's a constant steam of people lining the shores. You might think they're admiring the view, but they're not, they're relieving themselves. You'd be basically swimming in a giant toilet and who wants that? Not me that's for sure. As I mentioned before, there are boats lining the shores of Haad Rin beach. They're there to offer party goers rides back to wherever it is they came from. In daylight you wouldn't think twice about this but of an evening I'd say it's an absolute no go. These boats are scary enough during the day; have minimal lighting and if the seas are rough enough you'll be lucky to not be involved in an accident. If you've travelling from Samui or the likes, bear this in mind before you travel. If you don't think you can stay up until the morning, try and get some form of accommodation. It's much safer and you'll have a more enjoyable experience. The infamous flaming skipping rope is truly a fun spectacle. I spent around half an hour watching people attempt it and it wasn't long before some part of their body was singed. Unless you're confident you're covered by your insurance or it's on your bucket list, I'd give this a wide berth. A quick look on Youtube and you'll see the sorts of accidents people get into trying. It's just not worth it in my opinion. If someone asked you to do this anywhere else in the world, you probably wouldn't, so bare that in mind. 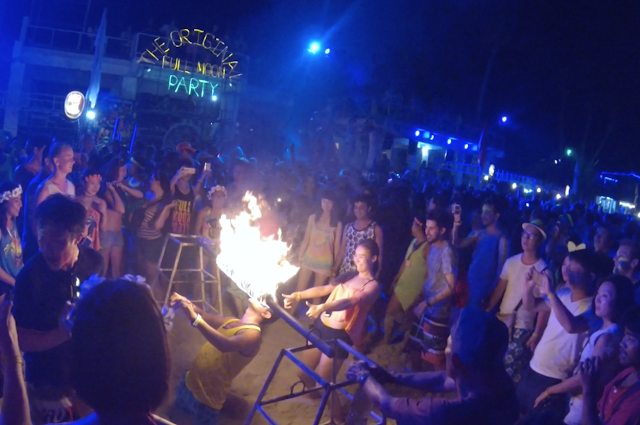 While I wasn't a victim myself, theft is a big problem at the Full Moon Party. A beach full of drunk people is pretty much a prime place to pick up cash, cameras and phones without being noticed. As a result you should aim to take as little as you can get away with. I took my GoPro; some cash; my room key and my phone. It's all I needed and I got through it. I would definitely have loved to take my DSLR for the photos but it's just too much of a risk sadly. Maybe next time eh. So there you have it, my guide to surviving the Full Moon Party. I'm by no means trying to be a killjoy but this is definitely a place where you want to have your wits about you for sure. Now go party and have fun guys! Oh and please wear shoes, that you will definitely thank me for!